Lovebird, in one manner of speaking, is specifically a bird. . . genus Agapornis: from the Greek Agape, for love, and Ornis, for Bird and is represented by 9 species. They get their name from the fact that they openly care for their mates. With a different thought in mind, lovebirds are also people who show open affection for one another. However, when this photo was taken the term seemed to translate to cats. Although Cringer and Marvin are males, they don't seem to care when it comes to displays of affection. They look like "lovebirds" to me. Well, you've put the cat among the lovebirds! If lovebirds can be people there is no reason why they can't be cats too. These two certainly look lovey dovey. 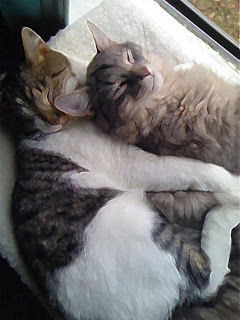 I LOVE these cat love birds!! Kitties are so great. What a wonderful interpretation!! Very cool. They do look in love! I like your interpretation (sp!) and I don't see why the lovebird reference can't be applied to cats!
. . . That's why I'm a dedicated iPhone Photographer and Collagist, working now, solely with the iPhone Camera and apps. to create this work. It's the synthesis of this incredible "phone" that pushes it beyond the allluring and into the addictive. And I DO love hyacinths and biscuits.